Situated in Laguna Beach, Nirvana Grille is a quaint California Community Kitchen offering fresh, local fare, sourced from area growers and purveyors. Our name - Nirvana - invokes feelings of harmony in mind, body and spirit. Nirvana Grille creates that environment using the clean, local are we just mentioned, we cook it to perfection and the serve it in a setting of casual, relaxed elegance. Nirvana Grille's uniquely fresh perspective on food puts our kitchen front and center - we call it ‘Clean California Cuisine'. Our ingredients are the foundation of our restaurant. At the local level, we work with purveyors to select the best provisions they offer at the market. Those one -on-one relationships allow us to keep our menu seasonal, so we cook just like our forefathers did. What is our menu composed of? We start with all-natural meats, free from hormones and antibiotics; organic free-range poultry from 'Mary’s'. This poultry is known for being plump and juicy; and sustainable seafood - products that are raised, caught and delivered in ways that support the sustainability of our oceans and rivers. You see that for us, it’s all about the food. 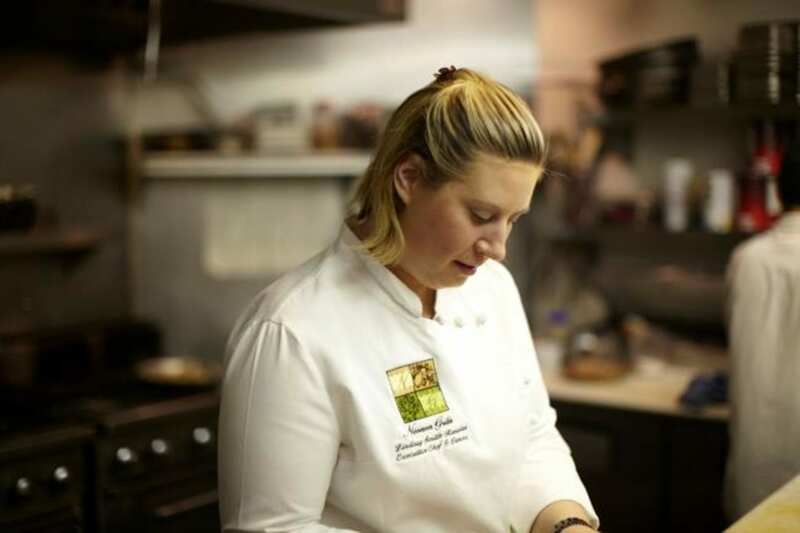 Nuances of American, French, Latin, and local-seasonally influenced fare has earned Executive Chef Lindsay Smith-Rosales and Nirvana Grille accolades from both the local press and her peers. Graced with the honor of being on the cover of numerous magazines including Laguna Beach Magazine as one of the ‘Top 4 Restaurants in Laguna’ as well AAA Westways Magazines’ ‘Top of the Must Recommend List for Orange County,’ Chef Lindsay was listed as one of the ‘Top 10 Chefs of Laguna’ and was the only female chef on OC Metros’ ‘Top 10 Chefs Under 40 in OC.' She was also named as one of the ‘Culinary Masters’ by the Rooster Foundation and 'Great Chefs of Orange County’ by the Kidney Foundation. Chef Lindsay has been written about for her culinary and sustainability efforts with mentions in: Coast Magazine, Riviera Magazine, Laguna Beach Magazine, Dining Out Magazine, Where Magazine, LA Enquirer, Laguna Beach Independent, and theLaguna Beach Coastline Pilot. Nirvana Grille has received rave reviews from Zagat, Yelp, Open Table, iDine and online foodie blogs. In addition to our Laguna Beach location, Nirvana Grille offers the public full-service catering (both on and off-premises), thereby sharing with Orange County, and beyond, a little of it's Nirvana with you. Born and raised in Laguna Beach, three sisters: Summer, Danielle, and Lindsay were all brought up by mother Vicki, father Michael, and stepfather Ken. Vicki, Michael and Ken were parents who raised their daughters to be health conscience vegetarians and they ended up with three independent, strong-willed, and successful daughters. Among all her culinary mentors, Lindsay was first inspired by her Mother Vicki. It was Vicki's joy and passion for food that Chef Lindsay now embraces. While young, Lindsay didn't know the impact Vicki's influence would have on her career. Words like: raw, organic, vegetarian, gluten-free, dairy-free, vegan, and juicing, were an integral part in the Smith/Stern households. While those terms are commonly used today, they were rarely heard 20 years ago. Stepfather, Ken, taught Linday stability, financial responsibility, business sense, and to not forget to have fun in the process. His influence continues to this day. Her father, Michael, was a driving force promoting Lindsay to constantly keep high expectations of herself, the restaurant, and the individuals behind the restaurant. Michael's influence to always going above and beyond expectations, leaving things better than how you find them became the calling card of Nirvana Catering. Lindsay enrolled in the culinary arts program at Orange Coast College at the age of 18. After her first experiences in the industry, she went to work (in catering) for Fox Studios, Universal Studios and Cienega Catering in Los Angeles, as well as in Orange County with Five Feet, Creme de la Cream, Sherman Gardens and Pascal Olhats. Chef Pascal hired Lindsay for her first kitchen position, a line cook. Working alongside the admired French Chef, Lindsay gained insight into what running a restaurant, market & specialty shop could be like. It was at this juncture that Lindsay accepted the most important job in her budding career - a position at The Ritz Carlton, Laguna Niguel. Lindsay thrived at The Ritz Carlton. During her tenure, Lindsay met Luis Rosales. It was a match made by the food Gods! She continued to fine-tune her skills in all aspects of the hospitality industry - working in the pastry and culinary kitchens. Lindsay went one step further, and learned the front of the house positions in the restaurant: namely event planning and reservations business. Now with her own restaurant, Chef Lindsay’s explorations take her to new heights, and she constantly gains knowledge of different culinary approaches, and techniques, both new & old - so the menu at Nirvana Grille changes not only with the seasons, but also with Chef Lindsay's culinary inspirations, executed with the help and support of her Nirvana family. Luis Fernando Rosales was born in Tepic, Nayarit, Mexico, and was one of of seven boys. Growing up in Mexico, soccer was a huge part of the Rosales' lives, and as a teen, Luis became a semi-professional player on a club team. After some time playing, Luis decided to follow his family to the United States in 1989. Luis entered the restaurant/hospitality industry and never looked back. He worked with The Dana Point Marriott Seacliff Resort, The St. Regis resort, The Montage Resort Laguna Beach, and spent 15 years as a dedicated server at The Ritz Carlton, Laguna Niguel. Luis has continually expanded his knowledge and experience working at high-end hotels and restaurants by focusing on the true meaning behind the words "customer service", as well as increasing his knowledge of wine through integrative wine training. As a supportive partner in Nirvana Grille, Luis' skill set in operations of the "front" and the "back" of the House is invaluable. 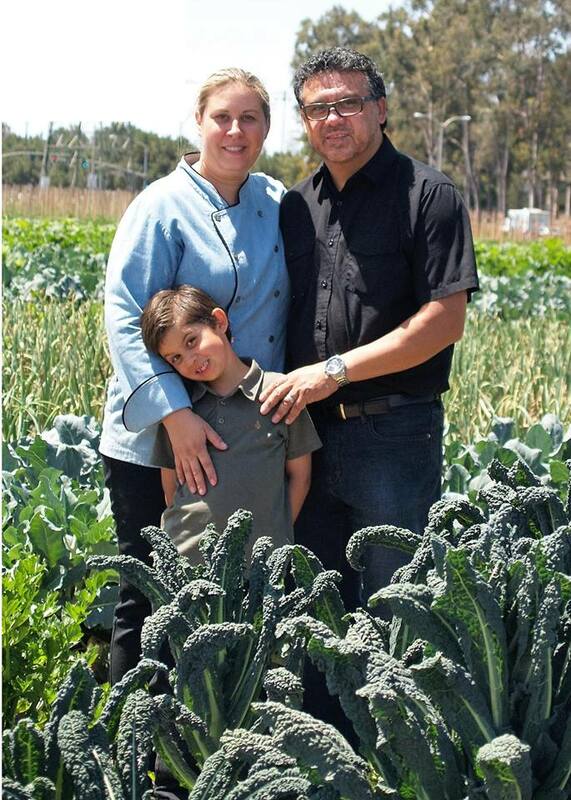 Chef Lindsay and Luis have two beautiful boys, Diego - 10 years old and Matteo, almost 2 years old. Both boys have grown up around Nirvana Grille, dining and spending time in the restaurant. Both boys love food! Why is our Kid's Menu such a hit? Because Chef Lindsay tests every recipe with Diego and Matteo. Matteo is sometimes found with more food on top of his head, than in his belly! Diego is quite the helper! This summer he took on visiting each table every night and asking guests what they like about their meal. He's putting all the information he's gathered into a notebook for his parents review! Not bad for a ten year old. These boys will take over Nirvana Grille someday. In the meantime, watch out for Diego & Matteo. Over the last year we have developed an important ongoing fundraising program to contribute to the organizations that are important to YOU! Join us for dinner on any Sunday of the current month and we will donate 10% of your pre-tax food bill to the community organization of your choice: Your childrens’ school, your church, your local non-profit, or any cause that raises money to fund their programs that are not-for profit! At the end of every month, turn in your CCB card and we will write a check to your chosen organization on your behalf. Nirvana Grille believes that our connection to our community is the lifeblood of the restaurant. Our loyal customers support us year round, so CCB is our way of saying thank you for that support over the past ten successful years of ‘Bliss’ at Nirvana Grille! "The flavors were beautifully married and so diverse. We would definitely make this a go to place when we visit Laguna Beach.” – Windy M.
“Great food, great service. We keep coming back again and again!” – Nancy B. “The service was outstanding! Our server was so accommodating and attentive to our table!” – Amanda P.
“I’d come back here in a heartbeat. Great experience.” – Kim H.
“Nirvana is always fresh and delicious. The New Rooftop “Bliss Bar” is fun when the weather is nice – you should check them out.” – Gina M.
“Absolutely worth every penny! Great food, great service, wonderful setting.” – Renie F.
“Great food, value and ambiance.” – Shirley D.
“I love Nirvana Grille. Why? First and foremost, if the food weren’t so good, I wouldn’t be taking time to write this. The main reason why I love Nirvana is the thought and compassion behind the menu and the philosophy that goes along with it. I recently have adopted a more plant based diet and truly appreciate that Nirvana has so many selections to choose from. Part of my reasoning to adopt this dietary change is two fold. I have seen vast improvement in my cholesterol with this type of diet. I’ve always had a compassion for animals and have learned more of the importance of ethical treatment of farm animals. Nirvana seems to be of the like mind on this issue and I can completely support a restaurant that takes measures to serve local, organic and humanely treated animals. Myself and my partner Zell, have been customers of the restaurant for several years, probably since the Mission Viejo location opened. Supporting a neighborhood restaurant is at the top of my list when it comes to dining choices, whether it be for special occasions or everyday dining. I hope your concept catches on!” – Michele E.
What do you love about Nirvana Grille? Please fill out the form. At the end of every month, we will choose a loyal customer to win a dining gift certificate to Nirvana Grille.